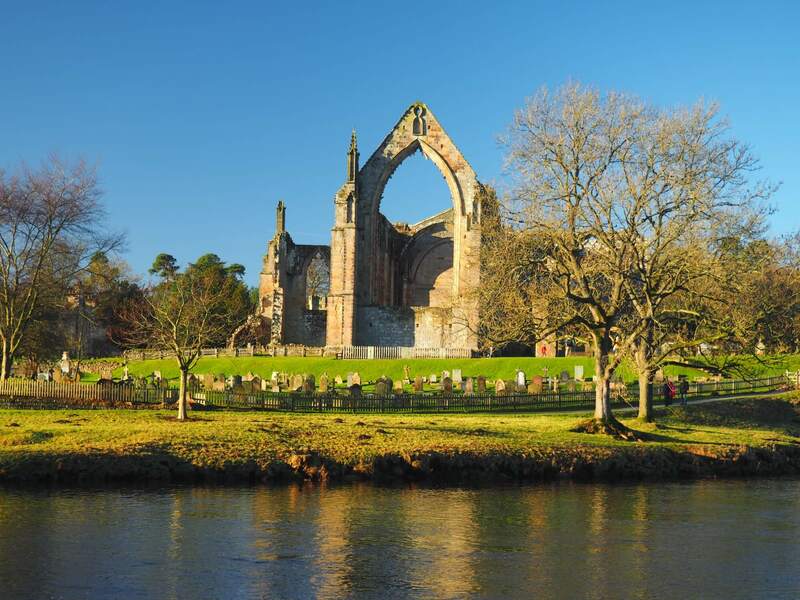 The classic short walk of just under three miles from Bolton Abbey to the Cavendish Pavillion and back along the other side of the river. With a cold but dry and sunny day forecast I was keen to try and get Lisa and Rhiannon out for one final walk before the end of the Christmas holidays. After doing a walk south along the River Wharfe from Bolton Bridge before Christmas I was also quite keen to visit Bolton Abbey again. Having paid what is now a rather hefty £10 to park at the car park we crossed over the road to pass through the ‘Hole in the Wall’. Through the hole there is a sudden and quite brilliant view of the Priory ruins above a bend in the river and a wooded bank opposite. Passing a couple of small frozen ponds we decided to have a walk around the ruins first. Rhiannon had been less than enthusiastic about going for a walk but as soon as we entered the ruins she did what she always does in these places and asked to play hide and seek! I was more than happy to oblige. In the end I made sure we didn’t remain hidden for too long and thus annoy Lisa who was trying to find us. Upon leaving the Priory ruins we walked down to Waterfall Bridge. The bridge is named after the waterfall that drops down the steep wooded bank opposite. A more entertaining alternative to the bridge are the stepping stones. On this occasion though the river was high and so the stepping stones weren’t an option. Indeed they were barely visible below the water. On the other side of the river we had two options, an upper and lower path. Taking the upper path we climbed up above the river to enjoy a fine view back down to the Priory. After joining up again weith the lower path our route descended down to where a minor road fords Pickles Beck. Here we came across a very unusual sight – a horde of dog walkers all out with Basset Hounds. We passed at least fifty of the sad eyed breed. We next enjoyed a more open section of riverbank which led us all too soon to the footbridge leading back across the river to the Cavendish Pavillion. Forsaking the cafe we sat on a bench next to the river to enjoy our own picnic. Sadly the next part of the walk is rather dominated by the massive car park which lines the riverbank. Finally we passed this to climb up to the Cavendish Memorial. A path alongside the road soon brought us back to the grounds of the Priory. Before returning to the car we had a little look around the inside of the Priory Church of St. Mary and St. Cuthbert which had been closed for a Sunday service when we arrived. All in all this was a lovely little walk. It is also one that could easily be extended by utilising the paths either south to Bolton Bridge or north to The Strid and Barden Bridge.